10-30-09: Kim Stanley Robinson Reads at SF in SF on October 17, 2009 : "The Lucky Strike"
Once again, the pleasures of discovery; and not just those of the writer. Here we are at SF in SF on November 17, and not without some trepidation, about to be subjected to a literary experiment. SF in SF has, for all my experience, been a fiction-only operation. Not that this has seemed a dictate; it's just the way it's happened. Eric Simons changed all that, and in the best possible way. He was just remarkably entertaining. I'm guessing he sold a few books. And with this reading from his novella, you get the best of both worlds. Robinson abridged his story while reading at SF in SF, off-the-cuff, so to speak, reading selections here and there that boil down the story and give a perfect verbal version of the much longer written version. 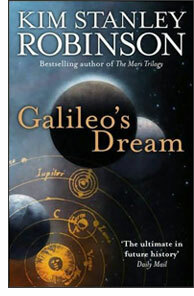 What’s so nice is that when you listen to the reading, you can get the emotional and intellectual shock of Robinson's story. You'll feel the literal blast that he describes as he reads. But because Robinson has read a self-abridged version of his longer story, you can still go out, but the book and read the story to get the fully fleshed-out as well as the live reading audio experience. This is a very clever move on his part, and not just because he sells you a book. No, it's much better than that. As a listener and a reader, you'll get to experience the same set events from two equally powerful perspectives; the reading experience will enhance the audio and vice versa, but in a different manner. It's a fascinating experiment for the writer and the reader. You can begin your experiment by following this link to the MP3 audio of the story. "She tried to talk me into a nice plane ride.."
So here's the plan for Simons' book. He just decided to follow in modern times, Darwin's trek through South America, remembering that when Darwin went on his voyage, he wasn't a stodgy old man but a dodgy young kid. And with that in place, Simons though all the places where people have replaced trees, and the places where literally nothing has changed. So settle back for some entertaining, sorta-science related travel-writing. Indeed, it won't involve you traveling much more than following the link to this MP3 audio file. Two aspects of that cover intrigued me. The first was the fact that all the names were women. I wasn't then, and still am not now, certain as to whether any other anthology series that is open to both men and women writers had ever done that. Of course the names are outstanding as well, Karen Joy Fowler, Elizabeth Bear, Caitlin Kiernan — all these and more are grabbers and add up to an enjoyable literary diversion. But I also loved the cover image, which, as I told Jeremy in our conversation, reminded me of the best of the 70's "World's Best SF" covers from the old Terry Carr series. He told me that the cover, by Richard Powers, had been obtained from the estate, and had been originally commissioned for another anthology that never came to pass. So, if any readers out there can tell me what anthology the cover was originally commissioned for, I'll send them the anthology. 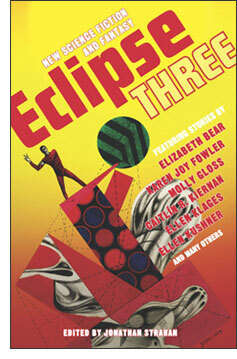 In the interim, give a listen to Jeremy and I talk about 'Eclipse 3' and the upcoming World Fantasy Convention by following this link to the MP3 audio file. This is something that drives a certain segment of our society absolutely crazy..."
...and in that quote we've not even begun to talk about paranoia! 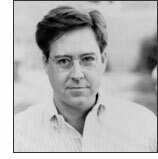 That's right, Thomas Frank is back, with a look at the big ideas in small events, the little bread crumbs that are found in the back pages of the newspaper that actually point out the huge changes coursing through our cultural and political establishments. This week, we looked at one of those tweedly, insider bits of news that opens up a new vista of vapidity and celebrated the upcoming 45th anniversary of a little bit of prescience on the part of Richard Hofstadter from the November 1964 edition of Harper's Magazine. I caught up with Thomas Frank as the tears started to roll down the face of a certain talk-show host. Actually, that's not hard! There's a whole lot of crying and self-pity going on in the political world. And fascinatingly, it starts from the smallest of seeds, from the Mike Enzi hold on Obama nominee Labor Department solicitor nominee Patricia Smith, guilty of having been an effective advocate for labor rights, in that she helped to start the Wage Watch program, chronicled in Frank's column for the Wall Street Journal,"The GOP vs. Labor Law". There's an interesting strain of politician afoot who seems to feel the needs to be a politician while denying the import of government; sort of like if your local police thought that laws were counterproductive in terms of encouraging and enforcing lawful behavior. It's funny, in a very depressing fashion. Frank and I also talk about The Paranoid Style in American Politics, by Richard Hofstadter, an essay writer some 45 years ago to address the then-minor-league phenomenon of the John Birch Society. It's a great essay, and it was especially fun, after reading Frank's essay for the Wall Street Journal, "From John Birchers to Birthers", to talk with him about the new ranks of the American Paranoids. These are people who have pioneered cry-on-demand television. Alas, their only reason for crying is their mind-boggling wealth. I have too much fun talking to Thomas Frank, and I trust you'll enjoy hearing his take on events as you follow this link to the MP3 audio file. "When you're writing for screen or TV, you're really only writing the cinematic." You know, I just didn't ask his first name. After about three minutes of talking to him, I would have sworn that the "E" in E. Van Lowe stood for "Enthusiastic." And not in a smarmy way, but in that sort of genuine, really-likes-writing manner. E — that's what I'll call him here, because that's what I called him in the interview — is one of the many writers I've met who has, simply put, found his calling. In this case, writing about zombies for high-school age girls. Hey, there's a niche for everyone in this world. The thing that sets 'Never Slow Dance With a Zombie' apart from the rest of the zombies is Van Lowe's sense of humor. It starts on page 1, and continues right through to the end of the book, and it came out in our interview at the generous digs of NPR West. E (I later found out from Scott "S. G." Browne that "E" stands in for Eric) approaches his subject with just the right combination of empathy (another good choice for lead initial fodder) and insouciance to get buy-in from readers of all ages. If you've ever been to high school, then E's got your number. Especially if that high school is infested with zombies, and you know, to my mind that's every high school in America! Just follow this link to the MP3 audio file to hear the simple rules for fighting zombies!